When the weather outside becomes thoroughly frightful, it can be frustrating to check the temperature on your Smart Outdoor Watch over and over to see when conditions will improve. Now, we're not talking about a simply cold day here, but rather a big blizzard with sub-zero temperatures - not exactly the best time to head out on the hike. When the sun returns, active individuals will be raring to get outside and move, but after heavy or prolonged snowfall, this can be less than idea for hiking. So, what's an outdoor enthusiast and master of the trail supposed to do? For starters, you can take inspiration from the Winter Olympics this year and try something new: Cross country skiing. Unfamiliar with cross country? Sports Illustrated presented the basics to entice you on to the trails. If you think you'll be gliding down the slopes with ease, think again. Once you've strapped on your skis, you'll be moving over mostly flat terrain. This means you need to use poles for balance and your own strength to get you gliding. The professions who you can catch when the Olympics are aired have two techniques. They either stride forward, keeping the skis essentially straight. Or they use the "free" method, where skiers move forward in a rocking motion. Professional athletes can get up to speeds of about 15 miles per hour. Beginners, however, can expect to start out a little more slowly. For newbies, it might be best to take a couple of lessons first, Shape Magazine advised. This way, you can learn the technique from someone who knows what they are doing, in addition to practicing in a controlled environment. Many ski resorts or areas have special cross country trails. When you're confident on your own, you can often head out into the woods near you - but check with your local Parks and Recreation department first. Then, you need to look into equipment. If you are trying the sport for the first time, the source noted, rent boots, poles and skis. This way, you can decide if it's right is for you. It will take a little time to get the basics down, so be patient - you're learning something new, after all! You can also pack a small backpack in a similar manner to how you would assemble items for a day hike. Have water, sunscreen, sunglasses and a small snack or two for while you are out. Additionally, you will want to dress like you're going out for a hike or a long run. Downhill skiing often involves a lot of sitting and waiting and then heading into the cold wind. 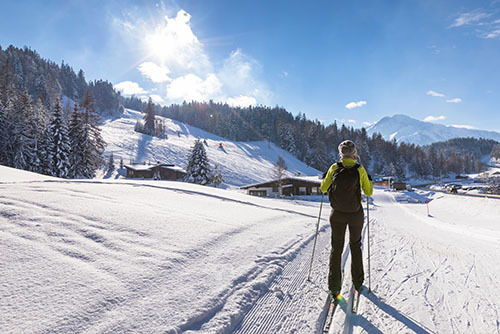 The source said that when you cross country ski, you move as if you were out on a hike, so layer up with moisture-wicking garments to stay warm - but not too hot. REI advised that you should stretch before starting out. The activity uses muscles which may not normally be activated, and you don't want to stiffen up. Take some time to practice your moves first - and definitely cross country ski with someone who knows what they are doing. Going alone for the first time, even at a ski resort is not advised. To climb uphill, you will want to employ herringbone technique and to descend, you should know how to use snowplow technique, the source added. If you have no idea what either of these mean, take lessons first, and then practice on a smaller area until you feel confident. Remember to bring wax for your skis with you, and you are ready to go. It's always fun to try different activities in different seasons. So when the snow stops and the weather clears up, grab a couple of friends and have a go at cross country skiing. You may have found your new favorite winter sport!